Rail and ferry travel has been disrupted and dozens of schools have been shut in Scotland due to Storm Caroline's strong winds. The Met Office has amber "be prepared" and yellow "be aware" warnings in place for Thursday's storm for Scotland. Yellow warnings have been issued for snow, ice and wind on Friday and Saturday for large parts of the UK. Some rail services have, however, now been restored as the worst of the storm moved away. The West Highland line re-opened and speed restrictions were lifted on Inverness - Aberdeen route. Mountaineering Scotland has reported gusts reaching 116mph on the summit of Cairn Gorm mountain in the Cairngorms. Winds gusting to 91mph have also been recorded at Dounreay nuclear site in Caithness, which was closed for the day at 13:00 because of the bad weather. High winds in Orkney have seen wave heights of up 45ft (14m) being recorded at the European Marine Energy Centre's Billia Croo wave test site. The Met Office updated its yellow warning for snow and ice on Thursday to include southern Scotland and Northern Ireland. All schools on Lewis, Harris, Uist and Barra in the Western Isles have been closed to pupils as a precaution. Electricity company SSE Networks confirmed power has been safely restored to more than 11,500 customers. The main areas affected were the Western Isles, north west Highlands, Caithness, Moray, north east Aberdeenshire, Orkney and Shetland. As of 16:00 about 4,600 homes remained without power, mainly in Caithness, Orkney and Shetland. The company said teams were working to restore power where it was safe to do so. In the Highland Council area, more than 50 schools, which include nurseries, primary and secondary schools, were closed because of the weather. A council spokeswoman confirmed Wick Campus - including Wick High School, Newtonpark Primary School and High Life Highland Leisure facilities - will remain closed on Friday after the gym roof was damaged. All schools in Orkney were closed from 11:30. In Shetland, where police have warned of debris on roads in Lerwick and issues affecting the A970, all schools were closed from lunchtime and will remain shut on Friday. Two schools in Moray were also closed early because of the weather. Rail services between Glasgow Central and Neilston were disrupted for almost two hours after a trampoline blew onto the track at Patterton in East Renfrewshire. At the height of the storm, the bus company Stagecoach said it had to suspended its services in the north of Scotland. Ferry operators Caledonian MacBrayne and Serco Northlink warned of continuing disruption to routes on Scotland's west and north coasts. Ferry sailings to and from Shetland were cancelled on Thursday night. Serco Northlink is also advising customers that both of Friday's passenger sailings from Lerwick and Aberdeen are under review with a high probability of cancellations. The crew of the ferry Hamnavoe that left Scrabster in Caithness earlier on Thursday, had to seek shelter in Scapa Flow in Orkney having been unable to berth in Stromness. Due to concerns about large waves during the storm, all personnel have been taken off the North Sea platform Ninian Southern off Shetland and production shut down. CairnGorm Mountain snowsports centre near Aviemore was closed on Thursday because of the expected high winds. 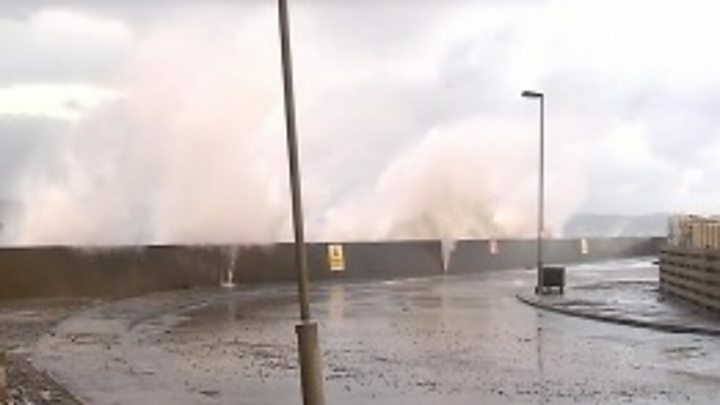 It has emerged that, as the storm approached Scotland, bad weather caused a gangway connected to a North Sea oil platform to separate from an accommodation vessel. The gangway between the Safe Boreas and the Mariner platform east of Shetland automatically disconnected due to worsening weather conditions. Statoil said no-one was injured, but it did leave 36 workers, who were on the neighbouring Noble Lloyd Noble rig unable to get back to the accommodation vessel. They made the short journey on Thursday morning by helicopter.